At the opening of the P&T/EXPO Comm in Beijing today, Broadcom announced availability of two new switch products in their StrataXGS line, targeting the aggregation portion of networks; the BCM56640 for modular platforms, and the BCM56540 for fixed carrier Ethernet platforms. 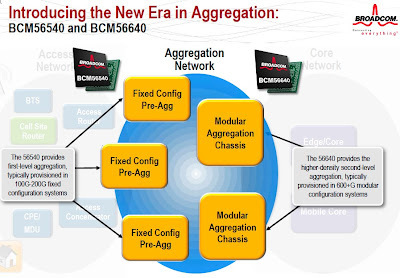 The new products extend Broadcom's offering for Carrier Ethernet solutions, which include the BCM88600 series for the network core, and the BCM56440 series for access and mobile backhaul networks. The BCM56640 enables designers to employ a 240 Gbps fully-integrated multilayer Carrier Ethernet aggregation switch, to develop single-chip line cards with front panel connectivity that can support 48 Gigabit Ethernet (GbE), twelve 10Gigabit Ethernet (10GE), three 40Gigabit Ethernet (40GE), or a single 100Gigabit Ethernet (100GE) port(s). The BCM56640 includes an expansion interface that you can use to add an optional external memory to support up to 512K IPv6 longest-prefix route lookups. The BCM56540 is a 180 Gbps fully-integrated multilayer Carrier Ethernet switch for fixed platforms. Broadcom’s flexible port logic, which they have dubbed F.XAUI (10 Gigabit Media Independent Interface), allows engineers to reassign 10GE interfaces on the fly for use as 1 GbE or 2.5GbE ports. Broadcom has developed a nw flexible forwarding technology, which allows providers to allocate lookup resources with the BCM56540 on a per-application basis, to improve the application range of a given system solution. Jim McKeon, Product Marketing Director in the Network Switch Infrastructure & Networking Group at Broadcom, says that the transition of networks from voice-centric to data-centric challenges operators to find optimal solutions for upgrading and building out their new data networks. He says that operators have two alternatives, a less disruptive packet transport network (PTN) with the 'look and feel' of a voice-oriented network, or an internet protocol radio-access network (IP-RAN) for better long-term scalability. 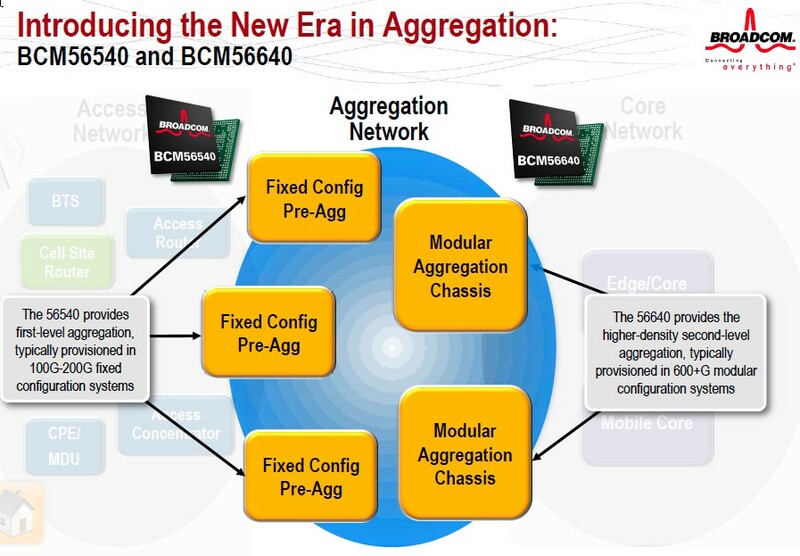 Broadcom has designed the new BCM 56640 and BCM 56540 to be ideally suited for both PTN and IP-RAN deployments, so that engineers can build unified systems that are not constrained by the silicon, according to McKeon. Broadcom says that samples for the BCM56640 and BCM56540 are available now, and the company is targeting production volume for the first half of 2012.